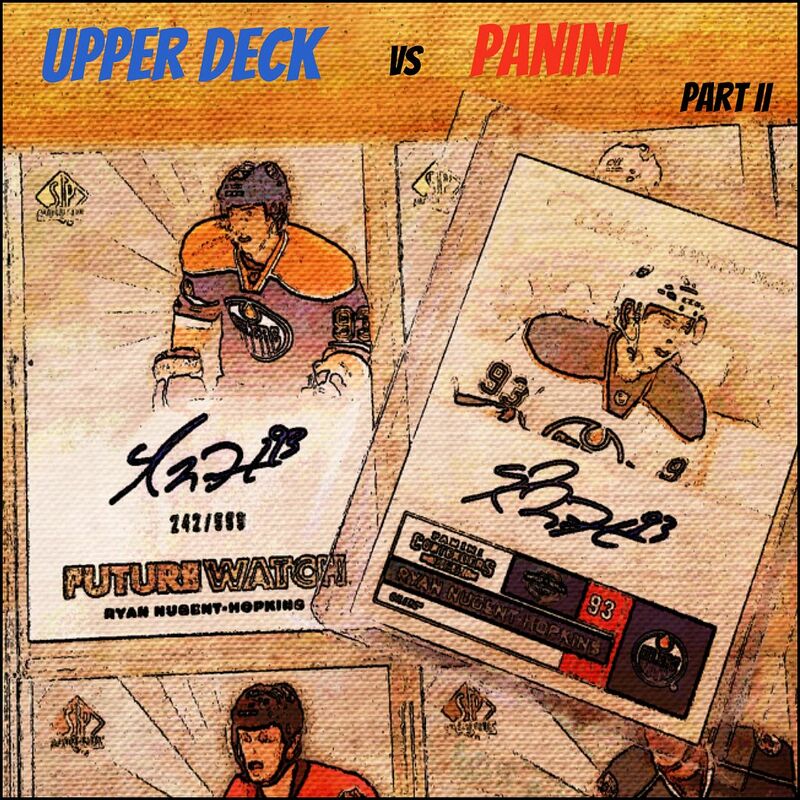 Last week's Cardboard Commentary looked at long-time hockey card Manufacturer Upper Deck. We saw that Upper Deck's hold on the hockey card hobby is very strong. Their products look great and hold value. Upper Deck also has a few exclusive signers like Wayne Gretzky and Bobby Orr that really boost the content of their product lines. This week the scope moves to Panini. Panini entered the hockey card scene starting with the 2010/11 hockey season. It was a great season to begin manufacturing cards as that year's rookie class was strong in terms of talent and collector interest. What has Panini done well since they entered the hockey world? What has Panini done poorly? And what changes should Panini consider making? I'll talk about all these things coming right up! As usual I'd like to start with the good... and Panini certainly does have its strong suits. First of all, as the new kid on the block, Panini shook up the hockey collecting world by introducing new ideas and product lines. Panini reinvigorated many in the hobby by bringing back old legacy brands that collectors fondly remembered collecting in the past. Products like Score, Pinnacle, and Crown Royale were just some of the old classics that were revived. It was a very smart maneuver to obtain these old licenses for reintroduction. Collectors love their pasts, and Panini played it smart by utilizing these classic brand names. While having older brands was great, it was important to make them worth purchasing. And Panini did that by implementing some great ideas into the then Upper Deck dominated landscape. Score, in particular that first year, brought back a ton of memories. The cards looked and felt like the Score of old. Though Score is a low-end product, collectors flocked to it because the designs were different than what Upper Deck was doing at the time. I'm sure collectors had gotten a bit tired of Victory and MVP. Score was different and nostalgic enough to be a huge hit. And for the seasoned collector, there were some pretty rare cards to chase within Score - the buyback autographs and French back parallel cards. Crown Royale was another brand that triggered collector's desire for the past, but from a higher-end perspective. These one-hit-per-pack, four-pack-per-box cards were elegantly designed and eclectic. Talk about a completely different design that hadn't been seen in years! Collectors were ready for cards of this quality and boldness. They were like Artifacts on steroids. And to top it off, Crown Royale introduced the Rookie Silhouette cards to the hockey world. These cards featured a huge patch set behind a die-cut of the featured player. They were instantly the hottest cards to get. I remember boxes of Crown Royale steadily increasing as it became harder and harder to find. But Panini didn't just rely on the past to drive it's way into the hobby. It was awesome to see new products come in to hockey like Limited, Prime, and Dominion. These high-end products really shined as the spotlight highlighted some amazing patch cards and autographs. One of my all time favorite patch sets is the Manufacture's Mark set from Limited. Those cards featured the entire Reebok logo from the back of the player's jersey. All the Manufacture Mark cards are one of ones. In Prime, collectors could literally put together an entire logo if they were somehow able to complete a print-run of a certain player's card. And Dominion featured very large patches on their rookie cards - bigger than those of their main rival from Upper Deck, the Cup. Panini put the pedal to the metal and went for broke in giving collectors memorabilia content. With memorabilia content, sometimes issues can arise, like... are these legitimate? Have pieces of the card been faked? Panini solves this problem in a couple ways. First, Panini has special anti-tampering measures built into their cards with prime material pieces! Since 2007 Panini has placed an invisible marking on their cards that they can verify. If collectors want proof that their card is 'legit', they can actually make a request to Panini and get it certified. The card is then sealed up and shipped back. From then on the card can actually be looked up on the Panini site. That is thoroughly cool I have to say. It's a process that costs about $10, but can give piece of mind to the skeptical collectors out there. The second way Panini gives collectors piece of mind is through their transparency as a company. What I mean by transparency is that Panini is a very open company. No other company utilizes their social media outlets to let collectors in on what's going on better than they do. Panini frequently shows off video of how they make cards, shows galleries of high-end cards (which can be used to verify if cards are legitimate or not), let's collectors know when signed content arrives to them, and frequently updates their own company blog - The Knights Lance. Panini has really led the way in letting collectors in on their company. It's a practice that I think other companies should follow Panini in. Though there are many positives to be said about Panini, they are not without their flaws too. As the newest company in hockey, they have shown some inexperience with product development. While some products have been massive hits, Panini has also had a few pretty big letdowns. Donruss, Zenith, and Classics Autographs come to mind in this area. With Donruss, Panini failed to be nostalgic enough. That product line pretty much was an inferior version of Pinnacle. With both being at around the same price point, Donruss was not able to keep up. I have said this before, but with Donruss, I wished they took the approach they did with basketball - to make it a real old school brand... as in 1980's old school. What actually came out was a set that was neither here nor there. It was sad to see Panini fall on its face with such a great legacy brand. With Zenith, Panini certainly under-delivered. Before it came out collectors were chomping at the bit to get some. In the past, Zenith was one of the highest-end cards you could get. Panini's revival of it set it squarely in the mid-range product area... and the cards just didn't look good. Uhh, Winter Warriors jersey cards? No thank you. Boxes of these cards fell dramatically. At their current price point of under $50 they are about right. Still, a bad misfire. Classics Autographs that came out earlier this year was set at an initial price that was way too high. And with this example, I want to highlight a trend with Panini products - they all tend to fall dramatically in price after short while (save for a select few). I'm not sure why Panini chooses to set their prices so high initially, but box prices for most Panini products just drop and drop and drop a month or so after release. Is it overproduction? Loss of collector interest? It could be both of these. Panini products just don't hold their value very well. Looking on sites like eBay, Panini cards tend to be good values to buy... but as a seller, or if you're trying to trade, Panini cards tend to offer less value compared to Upper Deck. So what can Panini do? Well, I think Panini has been stepping up their game already. They have seemed to get stronger as the years have gone by with their product lines. Panini needs to continue working with their current brands and make them better. The designers at Panini need to take a good look at what their competition is doing... and exceed it. I mean, when looking at the Upper Deck and Panini product lines, you can see where the companies meet. Score goes with O-Pee-Chee. Pinnacle goes with Series 1 and 2. Artifacts goes with Certified. Limited with Ultimate. Dominion with the Cup. Panini needs to be better than Upper Deck's version of the same product level. They don't need to look the same or give off the same design or feel... they just need to be better. Looking at the little list I just came up with... I'm sorry to say that Upper Deck has the upper hand in all those areas, except for maybe O-Pee-Chee. Upper Deck's quality and value is higher in all cases. Can Panini do it? I believe that they can. Panini has given hockey collectors choice in the marketplace - it's really cool that Upper Deck has competition. I hope that Panini rises to the challenge and catches up with Upper Deck soon. I'd love to see the day when my Panini rookie card and my Upper Deck rookie card are of equal value. Will it ever happen? Let me know in the comments below! Also, let me know what you thought of this little comparison. Feel free to add your own thoughts! I probably got into hockey cards just as Panini were hitting their stride. The first product that really caught my eye was 11/12 Limited. I just loved the dark elegant motif that ran through that whole set, it really oozed class. Another I really went big on was 11/12 Contenders, it felt like a UD Series 1/2 but with better hits. With design I love a good use of white space, and this set was brilliant for it, especially with the patch/auto cards with the matt black background and subtle use of foil. Simple, yet beautiful. That said, Dominion 11/12 bordered on a bit too plain, definitely like the look of 10/11 Dominion more. For the most part though, I feel Panini have the edge on Upper Deck when it comes to design. They create cards that are striking and modern with a cohesive design and clear visual hierarchy. And they are getting better, 12/13 Limited is probably some of their best work. This comparison reminds me of O-Pee-Chee and Topps from the 1980's-1990's. I don't know exactly why but the O-pee-chee rookie cards are worth more than the Topps RC. For example, Patrict Roy '86 OPC RC books $125 while the exact same card but with Topps books $80. I'm guessing the print run is way less for OPC and that's the reason it's more expensive? Or is it a customer demand thing like it is with UD over Panini because Panini's products haven't graced as many audiences yet therefore people don't want them? Whatever it is, I think Panini's gaining some ground with all their revamping of old classic brands like you mentioned. I would definitely like to see what they come out with next. It seems they come out with the most innovative stuff. Prime was awesome for new things never before seen card pieces, like "Prime Ties" and "Seams Incredible". Also The new 12-13 Limited features net skirts from the nets of the Stanley Cup final, where players autographed them. That's something really innovative. Like wow, they got the balls to ask for that stuff. And also the mini-nets used in the All Star skills competition. Kind of creative. Do people really care for these items though? I guess they're trying to make up for the fact they can't have The Great One or Bobby Orr sign for them, hah!